After yesterday's post about mysterious explosions in distant galaxies, today I want to look at a colossal explosion that happened much, much closer to home -- and may have jump-started life on Earth. In a paper by Steven Benner of the Foundation for Applied Molecular Evolution in Alachua, Florida, presented at a conference last fall in Atlanta, we find out that there's geological evidence that early in Earth's history, there may have been a collision with an enormous object -- by some estimates, the size of the Moon -- that drastically altered the atmosphere. 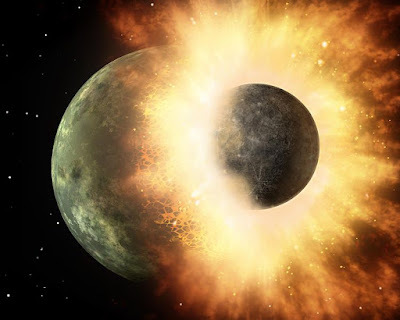 4.47 billion years ago, only sixty million years after the Earth coalesced from the ring of planetary debris where it originated, it was struck so hard by planetoid that water molecules were ripped apart into oxygen and hydrogen, and superheated metallic debris was flung into the air and generated a torrential rain of molten iron. As the atmosphere (and everything else) cooled, the highly reactive oxygen bound to the iron, forming a thick layer of iron (and other metal) oxides that explains their prevalence in the Earth's crust today. More interesting still is that the collision left behind the hydrogen in the atmosphere. This created what is called a reducing atmosphere -- a collection of gases with an abundance of free electrons, essentially the opposite of what we have today (an oxidizing atmosphere, where oxygen and other electronegative elements mop up any available electrons, making organic matter and other reduced compounds fall apart). The reducing atmosphere, Benner says, stuck around for two hundred million years, and it was during this time that the first organic compounds were formed. This lines up neatly with the famous Miller-Urey experiment, where biochemists Stanley Miller and Harold Urey of the University of Chicago showed back in 1952 that in the presence of reducing gases and a source of energy, organic compounds formed readily, including DNA and RNA nitrogenous bases, amino acids, and simple sugars. Benner believes that the critical one was RNA. RNA is (as far as we know) unique in that it can not only replicate itself, it's autocatalytic -- it can catalyze its own reactions. This pull-yourself-up-by-your-shoelaces ability is why a lot of scientists believe that the first genetic material was RNA, not the (currently) more ubiquitous DNA. And Benner's theory about how the reducing atmosphere was generated explains not only how the building blocks of RNA could have formed, but why the Earth's atmosphere was reducing in the first place. Benner believes the key is a set of biochemical reactions that involves repeated wetting and drying, along with interaction of the oxygen-free atmosphere with sulfur-containing gases released from volcanic eruptions. He has demonstrated that in these conditions, formaldehyde -- CH2O, one of the simplest organic compounds, would form "by the metric ton." From there, reactions with the sulfur-bearing gases produced hydroxymethanesulfonate, which reacts readily to form glyceraldehyde (a simple sugar) and the four bases of RNA, adenine, cytosine, guanine, and uracil. Once that happens, the autocatalytic ability of RNA means you're off to the races. As Richard Dawkins pointed out in his tour-de-force The Blind Watchmaker, if you have two things -- an imperfect replicator, and a selecting mechanism -- you can generate order from disorder in the blink of an eye. "[M]any experiments have confirmed that once RNA chains begin to grow, they can swap RNA letters and even whole sections with other strands, building complexity, variation, and new chemical functions," said science journalist Robert F. Service, writing for Science magazine. "[T]he impact scenario implies organic molecules, and possibly RNA and life, could have originated several hundred million years earlier than thought. That would allow plenty of time for complex cellular life to evolve by the time it shows up in the fossil record at 3.43 billion years ago." This research not only confirms what Miller and Urey showed in their landmark experiment 67 years ago, but lines up beautifully with what is known from studies by geologists of the earliest rocks. As for Benner, he's ready to put aside any doubt. When Ramon Brasser, paleogeologist at the Tokyo Institute of Technology, laid out a timeline of the early Earth in his talk at the Atlanta conference, Benner asked him when the atmosphere would have likely dropped below a temperature of 100 C, the boiling point of water. Brasser indicated a point about fifty million years after the impact with the planetoid. "That's it, then!" Benner said excitedly, pointing to a spot at about 4.35 billion years ago on the timeline. "Now we know exactly when RNA emerged. It's there—give or take a few million years."